DOCAT, says Pope Francis in the Introduction, "it is like a user’s manual that helps us to change ourselves with the Gospel first, and then our closest surroundings, and finally the whole world." DOCAT, the follow-up and companion volume to the popular YOUCAT (Youth Catechism), was officially released yesterday at World Youth Day 2016 in Kraków, Poland. DOCAT (pronounced “do-cat”) is a popular adaptation of the social doctrine of the Catholic Church that draws on Scripture, YOUCAT, the Catechism and the Compendium of Catholic Social Teaching, and features a foreword by Pope Francis (see below). As part of the release, a DOCAT app has been made available to all World Youth Day participants. 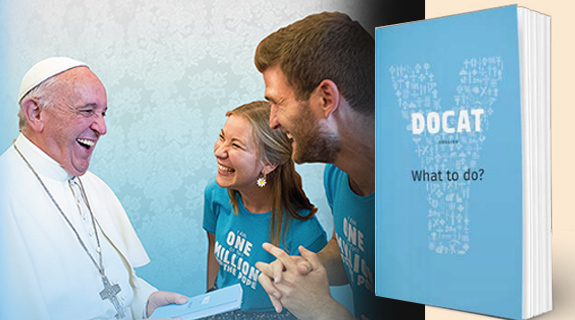 The app helps readers to start groups, participate in discussions, and do acts of justice as a present to the pope, who, in writing the foreword to DOCAT, shared his dream with youth on how to change the world. DOCAT features inspirational and insightful quotes from Catholic leaders and saints, including St. Pope John Paul II, Mother Teresa, Pope Francis and Pope Benedict; excerpts from Francis’ magisterial teaching; and important statements from his immediate predecessor regarding the four principles of Catholic social teaching: the dignity of the human person, the common good, subsidiarity and solidarity. Ignatius Press has also co-published, with the Augustine Institute, The DOCAT Study Guide, which is an aid for using the DOCAT in a classroom setting, at home, or in small groups. An 8-page, full-color flyer offering details about DOCAT and the Study Guide is available in PDF format from the Ignatius Press website. My predecessor, Pope Benedict XVI, put into your hands a Youth Catechism, YOUCAT. Today I would like to commend to you another book, DOCAT, which contains the social doctrine of the Church. The English verb “to do” is part of the title. DOCAT answers the question: “What should we do?”; it is like a user’s manual that helps us to change ourselves with the Gospel first, and then our closest surroundings, and finally the whole world. For with the power of the Gospel, we can truly change the world. Dear young friends! Only conversion of heart can make our world, which is full of terror and violence, more humane. And that means patience, justice, prudence, dialogue, integrity, solidarity with victims, the needy, and the poorest, limitless dedication, love even unto death for the sake of the other. When you have understood that quite deeply, then you can change the world as committed Christians. The world cannot continue down the path that it is taking now. If a Christian in these days looks away from the need of the poorest of the poor, then in reality he is not a Christian! Can we not do more to make this revolution of love and justice a reality in many parts of this tormented planet? The social doctrine of the Church can help so many people! Under the experienced direction of Cardinals Christoph Schönborn and Reinhard Marx, a team set to work to bring the liberating message of Catholic social doctrine to the attention of the youth of the world. They collaborated with famous scholars and also with young people on this project. Young Catholic women and men from all over the world sent in their best photos. Other young people discussed the text, offered their questions and suggestions, and made sure that the text is readily comprehensible. Social doctrine calls that “participation”! The team itself applied an important principle of the social doctrine from the start. Thus DOCAT became a magnificent introduction to Christian action. What we call Catholic social teaching today came about in the nineteenth century. With industrialization, a brutal form of capitalism arose: a sort of economy that destroyed human beings. Unscrupulous industrialists reduced the impoverished rural population to the point where they toiled in mines or in rusty factories for starvation wages. Children no longer saw the light of day. They were sent underground like slaves to pull coal carts. With great commitment, Christians offered aid to those in need, but they noticed that that was not enough. So they developed ideas for counteracting the injustice socially and politically as well. Actually the fundamental proclamation of Catholic social doctrine was and is the 1891 encyclical letter by Pope Leo XIII, Rerum novarum, “On Capital and Labor.” The Pope wrote clearly and unmistakably: “To defraud any one of wages that are his due is a great crime which cries to the avenging anger of Heaven.” With the full weight of her authority, the Church fought for the rights of the workers. Because the needs of the time demanded it, Catholic social teaching was increasingly enriched and re ned over the years. Many people debated about community, justice, peace, and the common good. They found the principles of personhood, solidarity, and subsidiarity, which DOCAT, too, explains. But actually this social doctrine does not come from any particular pope or from any particular scholar. It comes from the heart of the Gospel. It comes from Jesus himself. Jesus is the social teaching of God. “This economy kills”, I wrote in my apostolic exhortation Evangelii Gaudium, for today that economy of exclusion and disparity of incomes still exists. There are countries in which 40 or 50 percent of the young people are unemployed. In many societies, older people are marginalized because they seemingly have no “value” and are no longer “productive”. Great stretches of land are depopulated because the poor of the earth flee to the slums of the major cities in the hope of finding something left there on which to survive. The production methods of a globalized economy have destroyed the modest economic and agricultural structures of their native regions. By now, approximately 1 percent of the world’s population owns 40 percent of the entire wealth of the world, and 10 percent of the world’s population owns 85 percent of the wealth. On the other hand, just about 1 percent of this world “belongs” to half of the world’s population. About 1.4 billion human beings live on less than one euro [approximately $1.10] per day. When I invite you all now really to get to know the social doctrine of the Church, I am dreaming not just about groups that sit under trees and discuss it. That is good! Do that! My dream is of something greater: I wish I had a million young Christians or, even better, a whole generation who are for their contemporaries “walking, talking social doctrine”. Nothing else will change the world but people who with Jesus devote themselves to it, who with him go to the margins and right into the middle of the dirt. Go into politics, too, and fight for justice and human dignity, especially for the poorest of the poor. All of you are the Church. Make sure, then, that this Church is transformed, that she is alive, because she allows herself to be challenged by the cries of the dispossessed, by the pleading of the destitute, and by those for whom nobody cares. Become active yourselves, also. When many do that together, then there will be improvements in this world and people will sense that the Spirit of God is working through you. And maybe then you will be like torches that make the path to God brighter for these people. And so I give you this magnificent little book, hoping that it might kindle a re in you. I pray every day for you. Pray for me, too!